Dairy and Cheese – so common, they hardly need discussion. But maybe there’s something here to help you put that leftover dairy to use. Leftover cheese – photo from the Calorie Factory. Sure, there are a zillion ways to use cheese, but I’m primarily talking about little bits of leftover cheese littering up the fridge. Almost all cheese can be frozen and used later, although this will affect the texture and make it dry and crumbly. Thaw overnight in the fridge for best results. I’d recommend only freezing common grocery store cheese and using it in something where texture won’t matter, like casseroles. Particularly good if added to mashed potatoes, polenta and grits but good in other vegetable purees too. I think I just might have more than one recipe for Cheesy Grits on my blog. Almost any cheese, hard or soft can be used to make crostini or bruschetta, either a single cheese or several mixed together. Add herbs if desired. Same goes for pizza or flatbreads. Here’s a Four Cheese Flatbread from HowSweetEats. Scrambled eggs, omelets, frittatas, or quiches. These dishes are all good with almost any cheese or cheeses in a small or larger amounts. Instant Pots do a great job on Frittatas, like this Asparagus & Chive one, or maybe you’d like a stove to oven recipe this marvelous Asparagus one. No asparagus? Just sub what you have on hand. Bits and pieces of cheese, mixed or matched, hard or soft are always good in a salad. Hard, grated cheese can go in vinaigrettes (think Caesar.) Cheese, hard or soft, goes well in pasta salads, too, like this Antipasto Tortellini Salad. Stuff into baked potatoes, Twice Baked Potatoes, potato cakes, dates (Devils on Horseback), burgers (Juicy Lucy), meatloaf or just about any item you can think of. Add cherry tomatoes to a pan with olive oil and garlic over medium-high heat & blister, turn out to a small casserole, add cheese & broil. Eat with bread. This similar recipe is named Blistered Tomatoes in the Snow. Use all, or bits of this and that to cheese sauces, supplemented with another cheese if not enough. Mix up and top bread (think Welch Rabbit), mix into Mac & Cheese, add bits to up the flavor in Alfredo, and so on. We kind of like this Three Cheese Chicken Casserole and it’s forgiving enough to just add a bit of this and that. Top a tomato, zucchini or other vegetable and broil. Mix cheese with breadcrumbs and do the same or use the mixture to top almost any casserole. See my post on Breadcrumbs for a great topping mixed with cheese. Parmesan might be the most thought of finish for risotto, but any cheese can complement the dish. Life’s Ambrosia has a Three Cheese Risotto. Oh, my. Just about any cheese can be added to a cheese sandwich or quesadilla. Quesadillas are a great way to up your leftover game with just about anything in the fridge. A little or a lot can be stirred in, off heat to give cream soups a little more flavor, and all kinds of bits and pieces may go in a cheese soup, like this Beer Cheese Soup. Why not top or serve Cheesy Toasts with your soup? Scones, cheese bread of any kind, muffins, etc. I love this Beer Cheese Bread as a vehicle for using up a mix of cheeses. Store cheese with rinds, well wrapped in cheese paper, wax paper or parchment so it can breathe. If you’re using a fresh cheese like a feta, goat or queso, store in an airtight container. Be particularly careful with cleanliness. Save from doom by slicing and marinating soft cheeses. This marinated goat cheese is a favorite, but all kinds of soft cheese can be marinated in all kinds of things and that marinating will increase the shelf life. Liptauer is a spicy cheese spread that can be varied to your taste. It’s a fantastic use for a bit of this or that, especially if you use a cream or other cheese as a base and add bits of stronger cheese in. The French may blanch at the idea, but riff off boursin: add flavors and herbs to soft cheeses and use as a spread. Stir into tomato-based pasta sauce, melt into any hot pasta for a quick sauce, layer in casseroles like lasagna or this Cheesy Pasta Bake. Dice and coat with seasoned flour, dip in beaten egg and coat with breadcrumbs. Shallow fry till crisp and golden and serve with soup or salad. This Cheese Fritter recipe from Southern Fatty is mouth-watering! With any mild soft cheese, add bits of fruit, vegetables and/or nuts and use as a spread for crackers, toast, bagels. If using quickly, store cheese in plastic wrap, sealed container or a Ziploc bag, but for longer than a few days, store well wrapped in cheese paper, wax paper or parchment. Break up odds and ends and whiz them together in a food processor for a Cheese Spread. Almost any mixture will work, just watch so that you don’t overpower it with one particular flavor. You might want to add a soft cheese to bulk it up and round out the flavors. These can be made with just about any cheese you’d like. Cut cheese into fingers, freeze, coat in flour, then beaten egg , then roll in breadcrumbs and fry until lightly browned and melting. Check out this recipe for Real Wisconsin Cheese Curds. Roasted Cheese is a marvelous Mexican treat. It’s particularly good with a green salsa or sauce. Up your grilled cheese game with a Monte Cristo sandwich. Classically made with Gouda, other cheeses may be used. Remember Bennigan’s? Genius Kitchen has a copycat. Add to any steamed veggies, especially broccoli or cauliflower, to melt and form a sauce. Toss a little cheese in during the last minute or so of cooking if you’re heating frozen veggies in the microwave. Souffles don’t have to be a big huge thing. Make simple Country Souffles from you leftover cheese bits and whatever else you’d like to make. Make little individual ones to serve with salads. harder cheeses and grating cheeses, such as parmesan, pecorino, asiago, etc. Just serve in slivers with crackers and wine. Home-made crackers or breadsticks are an ideal place to sneak in a grated nubbin of leftover cheese. How about Spicy Southern Cheese Crackers from the Brown Eyed Baker? Just toss in whatever cheese you have. Grate the cheese, form into small rounds on a cookie sheet and bake at 400 degrees until melted and golden. Leave for a bit to firm, then remove and serve flat with salads or form into cups to fill. Tuck bits of cheese into puff pastry turnovers. Don’t these look turnovers from FabFood4All look incredible? Carry this idea and add bits of cheese to savory “pop tarts”, popovers, gougeres or other similar dishes. Sounds better in French? Grate parmesan over sliced or torn bread, drizzle with olive oil and saute until bubbling and golden. See my home-made Croutons recipe. Grate and toss into biscuits, savory scones, pie crust for savory items or any item that might use a little bite from some good cheese but isn’t so particular that amount matters. So cream cheese is a soft cheese, although here in the US we tend to treat cream cheese differently than the fancier or imported soft cheeses. Once cream cheese is opened it should keep up to a week or two, especially if kept clean and tightly wrapped. Watch for signs of spoilage: mold, an off odor or color, or any sliminess. Doesn’t this Roasted Red Pepper Cream Cheese Spread from Fearless Dining sound intriguing on crackers? And of course, cream cheese is great spread on crackers and topped with anything from Hot Pepper Jelly to my Spicy Tomato Jam. Mix together with finely diced vegetables and herbs to form your own topping. Garden Vegetable comes to mind immediately. Add in “Anything Bagel” spices for another. Or go sweet and mix with fruit or honey. Layer cream cheese in any number of sandwiches. It’s good with roast beef and it’s fantastic as a foil for the avocado on my Health Nut Avocado Sandwiches. Cream cheese makes scrambled eggs or omelets rich and creamy and it’s wonderful dabbed onto hot, crispy hashbrowns before serving. Try it on these Baked Potato Hashbrowns. Heavenly. Layer between two slices of bread and make French toast. Serve it with a fun jam for a great change of pace. Blackberry, Strawberry Rhubarb or Orange Marmalade come to mind. Make as few or as many as you want for a fun treat or appetizer. Just fill, seal and deep fry, oh my. Parmesan Rinds – photo from Foodie for Two. Rinds of hard cheese are like flavor packed power bombs of umami flavor. Don’t waste them. Toss them in the freezer and if you don’t have any, look for them at a discount at Trader Joe’s or cheese shops. If you’re curious about whether to eat the rind of any cheese, check out this post by Cheese Underground. Simmer rinds in stock together with your choice of flavorings. See this marvelous post about Parmesan Rinds and Brodo di Reggiano (Parmesan Broth) and ways to use it at Spades, Spatulas and Spoons. Marinate in olive oil together with herbs & spices. Think peppercorns, chilis, etc. Discard rind (or use in soup) and use the oil for drizzling or dipping. Use rinds in soup for deep umami flavor. Don’t discard the softened, flavored rind – it’s a special little treat on its own. This Winter Minestrone is a great example of using the rind. If you’ve only simmered your rind for a short while in a clear soup, freeze it again and use it for the next one. Add to risotto; it will flavor the rice as it cooks. Steep rinds in milk and cream, then strain to enhance white or bechamel sauces. Just about any kind of milk or milk product can languish in your fridge. Days get busy, planned recipes go by the wayside or suddenly habits change. Many have a long shelf life, longer than you think, especially when handled carefully: lid and put right back in the fridge…don’t leave it sit opened on the table or counter. Here are ideas, though, to use up an excess. The old-fashioned way to use up milk was to use sour milk in recipes. This is no longer recommended. Frozen milk may separate and become grainy, but is still safe. Think about using this in recipes or in coffee. It’s great for smoothies. Freeze in ice-cube trays & use about 7 cubes and 1/2 cup fruit, preferably frozen. Add a little liquid, such as juice, if needed to get blender going. There are all kinds of easy to make cheese recipes, from cottage cheese, queso fresco, paneer, mozzarella, etc. Most require very little effort and very little “hands-on” time. This is a no-brainer! See the recipe and all the helps and hints you could ever want on my post Simply Best Yogurt. Recipes like this generally use a good amount of milk, so are ideal if you’re looking to use yours up quickly. I love this Chocolate Pudding, and I bet you will, too. Think about any recipes that rely on a White Sauce to use an excess of milk. How about my Ultimate Ultimate Ultimate Mac & Cheese? There’s probably nothing that will get the family to drink more milk than this marvelous recipe for double chocolate Best Hot Chocolate. I mean c’mon! Buttermilk has a long shelf life, but sometimes we need a little inspiration to go through a carton. Mix with mayonnaise and an assortment of herbs. And of course, you can mix it with a Ranch packet – maybe you’d like to try my Home-Made Ranch Mix? Think mashed potatoes or another vegetable puree for a bit of rich, smoothy tanginess. Just substitute the buttermilk for the milk. Look for recipes that use buttermilk. Quick breads, muffins, donuts, pancakes, biscuits, shortbread, scones, cornbread are a start. If you’re making something with buttermilk, preplan and have ingredients on hand for another recipe. Buttermilk does seem to freeze better than other milk, perhaps because of the lower fat content. Figure out how much liquid your ice-cube tray holds, then how much each ice-cube will be so you can thaw an appropriate amount. The best way to freeze buttermilk? Or at least one of the easiest and most delish? Popsicles! Use a little cream all or in part for milk in recipes. It just makes them richer. 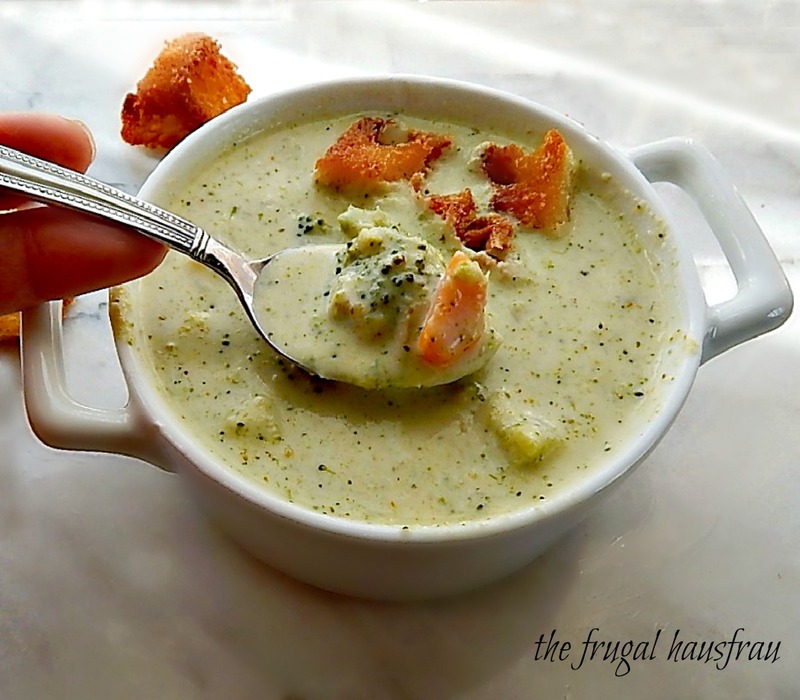 Cream may almost always be added to soups, especially vegetable or cheesy ones. Generally, you don’t want to simmer or boil after adding. While cream doesn’t freeze well in a liquid state, once whipped, dollop or pipe it out and freeze it. Use it later in beverages like hot chocolate. See Whipped Cream for the Freezer. Put it in a jar and give to the kids and have them shake it till it forms butter. Pour a little over your cooked vegetables; especially corn or spinach. Use very clean utensils, not ones that have touched the counter, to portion sour cream. Do not leave open to the air; at the very least loosely cover with the lid when out. Store upside down in the fridge. Savory: Use it on Mexican food or on/in baked or mashed potatoes. Sweet: Mix with whipping cream and/or something sweet for a rich topping for desserts or breakfast items. See my Roasted Pears with Lemon Cream for inspiration. Look for recipes that call for sour cream; most use small amounts, perfect for using up just a bit of sour cream. If you need to use a lot, try this Sour Cream Raisin Pie. Add to soup (off heat) to enrichen or just add a dab to your serving. Yes, you can use sour cream (if it’s not contaminated and has live cultures) to make your home-made sour cream. Sour cream makes an awesome salad dressing. You might wish to combine it with mayo, milk or buttermilk. It will make almost any creamy dressing; thin if needed. See my post on Salad Dressings for inspiration. Use yogurt in baking in place of buttermilk or sour cream – this is great for sweet baked goods and fantastic in things like meatballs and meatloaf, like this adaptation of Cook’s Illustrated. Creamy dressings are wonderful with yogurt; it has a good tang like buttermilk. May need to be thinned. Add herbs and use it as a savory sauce, like in this recipe for Herbed Yogurt Sauce served with Summer Squashes. Ya gotta love creamy, dreamy popsicles made from yogurt; healthy and delish. A favorite of ours is this Blackberry Yogurt Swirl Popsicle. Yogurt is a natural in creamy or cheesy dips and spreads. Use it as a sub for sour cream or in its own unique way. It’s great a natural pairing with Feta. Check this Skinny Feta Yogurt Dip from the Skinny Kitchen for inspiration. Add it to your smoothies for thick, shake like smoothies anytime. See how to Build a Better Berry Smoothie for our favorite, or maybe you’d like to add yogurt to my budget Big, Fat Green Smoothies. I’m sure there are dozens and dozens of other uses for leftover dairy – anyone out there have a go-to idea they’d like to share?